This student submission comes from my former student Lucy Grimmett. Her topic, from Algebra I: multiplying binomials like . How could you as a teacher create an activity of project that involves your topic? There are tons of activities that could be created with this topic. The first thing that came to mind was giving each student a notecard when they walked in the room. Each notecard would have a binomial on it. Students would be asked to find a partner in the classroom and multiply their binomials together. They would be able to assist one another, discuss possible misconceptions, and ask questions that they might not want to ask in front of an entire class. This could be a quick 5-minute warm up at the beginning of class, or could turn into a longer activity depending on how many partners you want each student to have. This wouldn’t involve much work on the teacher’s part; all you would have to do is create 30 differing binomials. If you feel the need to create a cheat sheet with answers to every possible pair you can, but that would involve more work then necessary. How does this topic extend from what your students should already have learned in previous courses? In previous courses and chapters in algebra, students are set up with knowledge of combining like terms. 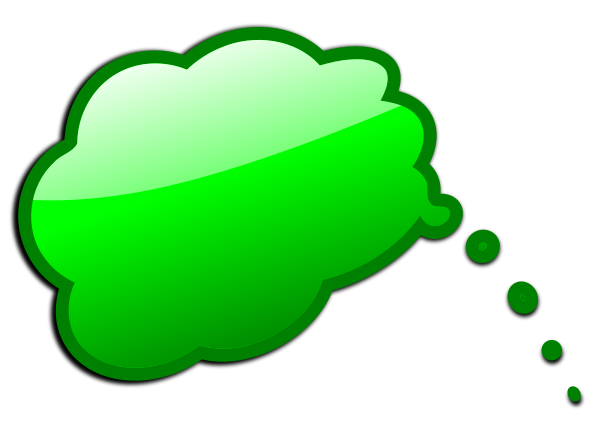 The most common idea of combining like terms is adding or subtracting, for example 2-1=1 or 2+1=3. Students don’t realize that in the elementary school they are combining like terms. This is a key tool used when multiplying binomials. As future math teachers, we know that when we see 2x + 3x we can quickly combine these numbers to get 5x. This simplifies an equation. Students will struggle with this at first because they will not be used to having a variable, such as x, mixed into the equation, literally. This will be a similar issue when discussing multiplying binomials. Students will have to get used to seeing (4x+1)(3x-8) and turning it into the longer version and then finding the like terms to simplify again, creating the shorter version . This is an extension of like-terms. 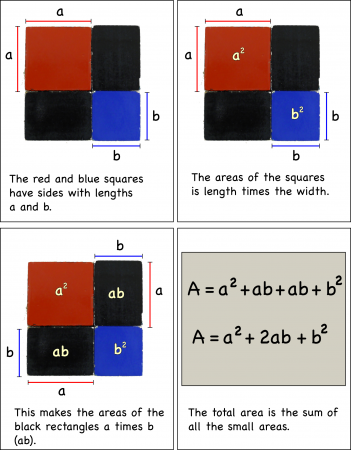 Algebra tiles are a great tool for students and teachers to use. 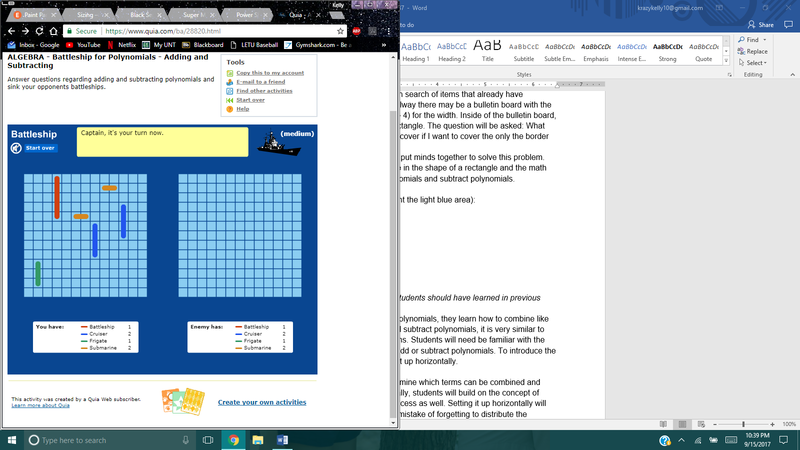 Even better is an online algebra tile map. This allows a teacher to show students how to use algebra times from a main point, such as a projector, rather then walking around the room and individually showing them. Teachers can have students work individually with their iPad’s (if they have them) or use actual algebra tiles. This would be a great engagement piece for a day when students are recapping distributing or “FOIL” as many teachers like to call it. This can also be a great discovery lesson when students are learning how to multiply binomials. This all depends on if students have used algebra tiles before, and how comfortable the teacher is with implementing a lesson like this in the classroom. Another idea is pairing students and giving them binomials to multiply, which they will present to the class in a short presentation using their online algebra tile tool. This student submission again comes from my former student Daniel Herfeldt. His topic, from Algebra: multiplying polynomials. Activities for multiplying polynomials are endless. An activity that I would do with my students is a game called polynomial dice. To do this, you would first is to get several blank dice and write random polynomials on each side of the dice. Then in class, divide the students into groups of no more than three. Each group will get a pair of dice. Have the students roll the dice and they should have two different polynomials. Once they have rolled, have them multiply the polynomials together. This is best done with groups so that the students can share their work with their partners to see if they both got the same answer. If they did not get the same answer, they can go back through each other’s steps to see where they went wrong. If you want to make the game a bit harder, you can add more dice to make them multiply three polynomials, or maybe even more. This is a great game because it can be used for multiplying polynomials, as well as dividing, adding and subtracting. It could be a great review game before a major test to have students remember how to do each individual property. For example, have the students roll the dice, then with the two polynomials they get, they first add the polynomials, followed by the difference, then the product, and finally the quotient. Multiplying polynomials is used all over mathematics. It is first introduced in Algebra I and Algebra II. Multiplying polynomials can be very difficult for students and make them not want to do the work. This is due to there being so much work for one problem. Since there is so much work, there is a lot of room for mistakes. This topic is used is Algebra I, Algebra II, Algebra III, Pre-Calculus, Calculus and just about every higher math course. If a student is looking to go into an architecture or engineering field, they will have to apply their knowledge of polynomials. Due to this, the topic is one of the most important topics that students need to understand. Knowing how to multiply polynomials also makes it easier to divide polynomials. If a student is struggling with dividing polynomials, you can go back to showing them how to multiply them. Once a student sees the pattern of multiplying polynomials, they are more likely to get the hang of dividing them. I believe this video would be a great engage for the students when you, as a teacher, are teaching the students how to multiply polynomials for the first time. This video helps students remember what exactly is a polynomial. Although there is only three types of polynomials in the video (monomial, binomial, and trinomial), it uses the three main types that students will be using in a high school level. Another great thing in the video is that it shows how to tell the degree of the polynomial. Although it seems easy to just say the power of x is the same as the degree, students still might forget how to do it. For example, a student might think that a digit by itself and with no variable has a degree of one, but is really a degree of zero. The final point that is key to this video is that it shows students how to line up the terms. Some students might put 6+x^2+3x, and although that is still correct, it will be better written as x^2+3x+6. I won’t repeat the whole post here, but it’s an excellent exercise in numeracy, or developing intuitive understanding of numbers without necessarily doing a ton of computations. It’s also a fun exercise to see how much we can figure out without resorting to plugging into a calculator. I highly recommend reading it. When I saw this problem, my first reflex wasn’t the technique used in the post. Instead, I thought to try the logic that follows. I don’t claim that this is a better way of solving the problem than the original solution linked above. But I do think that this alternative solution, in its own way, also encourages numeracy as well as what we can quickly determine without using a calculator. We can figure out which one is bigger without a calculator — or even directly figuring out each product. Each contains , so we can ignore this common term in both expressions. Also, and are both equal to , and so we can ignore the middle two terms of both expressions. The only difference is that there’s a on the top line and a on the bottom line. Therefore, the first numerator is the larger one, and so is the larger fraction. Once again, I really like the original question as a creative question that initially looks intractable that is nevertheless within the grasp of middle-school students. Also, I reiterate that I don’t claim that the above is a superior method, as I really like the method suggested in the original post. Instead, I humbly offer this alternate solution that encourages the development of numeracy. 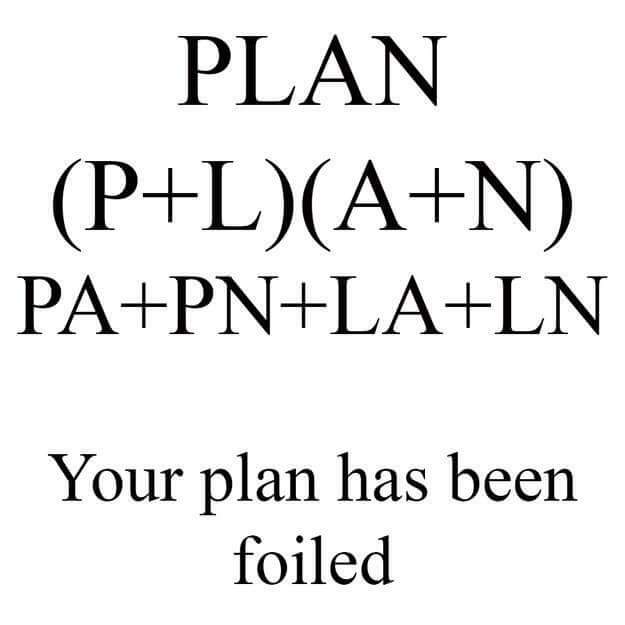 I normally prefer the phrase “by using the distributive law” instead of the more colloquial “by FOIL,” but I’ll make an exception in this case. This student submission again comes from my former student Andy Nabors. His topic, from Algebra: multiplying binomials. Multiplying binomials is an interesting concept because there are so many ways in which this can be done. I can think of five ways that binomials can be multiplied: FOIL, the box method, distribution, vertical multiplication, and with algebra tiles. I would incorporate these methods into one of two different ways. In either case, I would split the class into five groups. In the first way, I would assign each group a different method of multiplication. The groups would each be responsible for exploring their method, working together to master it. Then each group would be responsible for making a poster describing their method in detail. Then would then present their poster to the class, and the students not presenting would be taking notes. Already having one concept of binomial multiplication, the students would be seeing other methods and deciding which makes most sense to them. In my second idea, I would have five stations in the classroom each with their own method. The groups would rotate station to station figuring out the different methods collaboratively. The groups would rotate every 7-10 minutes until they had been to every station. Then the class would discuss the strengths/weaknesses of each method compared to the others in a class discussion moderated by the teacher. These activities rely on the students being able to work and learn in groups effectively, which would present difficulty if the class was not used to group work. I had the privilege of teaching a multiplying binomial lesson to a freshmen algebra one class in CI last spring. My partner and I focused on the box method first, and then used that to introduce FOIL. The box method was easier to grasp because of the visual nature of it. In fact, it looks a lot like something that the students will definitely see in their biology classes. The box method looks almost identical to gene Punnet Squares in biology. In fact, my partner and I used Punnet Squares in our Engage of that lesson. We reminded the students of what a Punnet Square was, and then showed them a filled out square. We went over how the boxes were filled: the letter on top of each column goes into the boxes below and the letters to the left of the box go in each box to the right. Then we showed them an empty Punnet Square with the same letters before. We inquired about what happens when two variables are multiplied together, then filled out the boxes with multiplication signs in between the letters. The students responded well and were able to grasp the concept fairly well from the onset. The internet is fast becoming the only place students will go for helpful solutions to school problems. This activity is designed to be a review of multiplying binomials that would allow students to use some internet resources, but make them report as to why the resource is helpful. The class will go to the computer lab or have laptops wheeled in and they will be given a list of sites that cover binomial multiplication. They will pick a site and write about the following qualities of their chosen site: what kind of site? (calculator, tutorial, manipulative, etc. ), how is it presented? (organized/easy to use), was it helpful? (just give an answer opposed to listing the steps), did it describe the method it used?, can you use it to do classwork?, etc. I will assume as a teacher that my students already look for easy solutions online, so I want to make sure they look in places that will help them gain understanding. I would stress that calculator sites are dangerous because if you just use them then you will not be able to perform on your own, but could be helpful to check your answer if you were worried. At the end of the lesson they would have a greater understanding of how to use internet sources effectively and have reviewed multiplying binomials. Is there a reason why the last two digits are perfect squares? I know it usually doesn’t work out this way. I leave a thought bubble in case you’d like to think this. One way of answering this question appears after the bubble. The answer is: This always happens as long as the tens digits is either 0 or 5. To see why, let’s expand , where and are nonnegative integers and . If is odd, then the tens digit of will be a 5. But if is even, then the tens digit of will be 0. The expression inside the parentheses is not important; what is important is that is a multiple of 100. Therefore, the contribution of this term to the last two digits of is zero. We conclude that the last two digits of is just . Naturally, elementary-school students are typically not ready for this level of abstraction. That’s what I love about this question: this is a completely natural question for a curious grade-school child to ask, but the teacher has to have a significantly deeper understanding of mathematics to understand the answer. This student submission again comes from my former student Brittney McCash. Her topic, from Algebra II: multiplying binomials. C3. How has this topic appeared in the news. For the engagement on this aspect of my topic, I would bring a binomial cube with me. I would pose the question, “What do we do when we multiply two binomials together?” The students, of course would not know the answer. I would then say, “Well let’s what one man did that they even did a news article about him!” This in itself catches the students attention because they are piqued about what exactly I am talking about. I would then pass out a copy of this news article so that the students could read. After popcorn reading out loud, we would discuss the article and about how we could use the binomial cube. I would then take out my cube (If possible, put students in groups and give each group a binomial cube to work with) and ask the students, “How in the world did he use this cube to multiply those binomials (points to equation on board)?” I would give them the hint that they have to add up the sides of the square and solve for the perimeter, and see what they can come up with. This is a great engagement for the kids because not only is it hands on, but the article brings in outside aspects of what they’re learning so that they realize they are not the only ones having to learn the material. It’s also a great way to introduce multiplying binomials because it starts at the beginning of adding variables (which they already know how to do), and it’s a visual representation of concept that is sometimes hard to grasp. It’s also a great way to lead into the FOIL, Box, etc…methods to take it into a deeper explanation. For those that have not heard of the binomial cube, here are some pictures of what the students will be working out. A great way to start off with this engagement would be to take the students back to sixth grade. Start off with asking students, “Who remembers when we had to learn how to add and subtract fractions?” Most, if not all, of the students should raise their hands. You can then ask, “Okay, good. So does anyone remember what the next step was after we learned how to add and subtract fractions? What did we learn how to do next?” The answer I am looking for here is multiplying and dividing. After that is established, you can lead in with, “Okay, so who can tell me what the next step would be with what we have previously been learning (adding and subtracting binomials)?” The answer is multiplication and division. Make sure to let them know that you will only be focusing on the multiplication aspect for now. Then you can pose some questions like, “What does multiplying binomials look like? How do we do it? Is there more than one way?” You can then go into a deeper exploration of multiplying binomials and the different ways you can do so. This is a good way to introduce multiplying binomials because not only did I bring in one concept students were already familiar with, I brought in two. I utilized something they already knew (even if subconsciously) back in middle school, and applied that same order to something more complex. It showed them that there was a purpose for learning what they did, and why there is a reason we go in the order that we do. Then you have the aspect of taking something they had been previously working on this semester and extending it further. This helps the students connect with what they are learning and realizing there is a purpose. Because multiplication is repeated addition, we are taking something they have previously learned, and extending it further. Another reason this is a good plan is because you start off with such a basic question, that every student knows the answer. This allows for immediate attention because all the students know what you are talking about, the more they understand, the more likely they are to participate in classroom discussion. This student submission comes from my former student Claire McMahon. Her topic, from Algebra I: multiplying binomials like . I personally have had the pleasure of teaching this part of Algebra 1 to a freshman high school class. The greatest part about the lesson was how the students were able to work together to really figure all of them out and better yet, they knew why! You can use several different versions of BINGO for practically anything in math. And who doesn’t love to win prizes. This website in particular has led me to some really great lesson plans and I credit a lot of this blog to a lot of the lesson plans I have personally implemented. Almost every one of them worked with almost little to no tweaking. I’m not exactly a huge fan of the FOIL concept so I used BINO instead of Bingo!! Just like singing the song and insert joke here. So here is the lesson on Distributive Bingo and how it works. The basic rundown is you give the students either the polynomial or the already factored binomials and have them solve it one way or the other. For example, if you are trying to focus more on the factoring and zeros making them go from a polynomial to factoring is good practice. The other really great thing is you can build scaffolds into the game itself by passing out hint cards or key concepts to help them figure out what they are looking for, similar to a formula sheet. One of the great things about the Internet is there is so much information constantly flowing in and out at all times. YouTube is a great asset when trying to reinforce good study habits and good metacognition. Most students are very visual and it gives step-by-step instructions on how to do almost anything. The other key thing is they can pause rewind and replay if necessary. If you prefer to have a safer environment for your students to browse then you can lean them toward teacher tube, which has all the same resources without the junk videos. Here is one of the many multiplying videos that show a method similar to a Punnet Square, which is in line with learning genetics and heredity. They might have already learned this in biology but if not then it’s a great visual representation of a multiplication table and they will learn it again in science. It’s easy for the students to check their work and for you to see where any misconceptions can arise.